PLP Architecture and researchers from the University of Cambridge have revealed a concept for London's first wooden skyscraper – a 300-metre-tall addition to the Barbican housing estate. Following the emerging trend for timber-framed high-rises, the 80-storey Oakwood Tower would have a timber frame. PLP Architecture and Cambridge University's Department of Architecture developed the proposal with engineer Smith and Wallwork to offer an alternative to traditional steel and concrete construction. "The use of timber could transform the way we build in this city," said PLP partner Kevin Flanagan. "Timber buildings have the potential architecturally to create a more pleasing, relaxed, sociable and creative urban experience"
The conceptual scheme was presented to London mayor Boris Johnson yesterday. 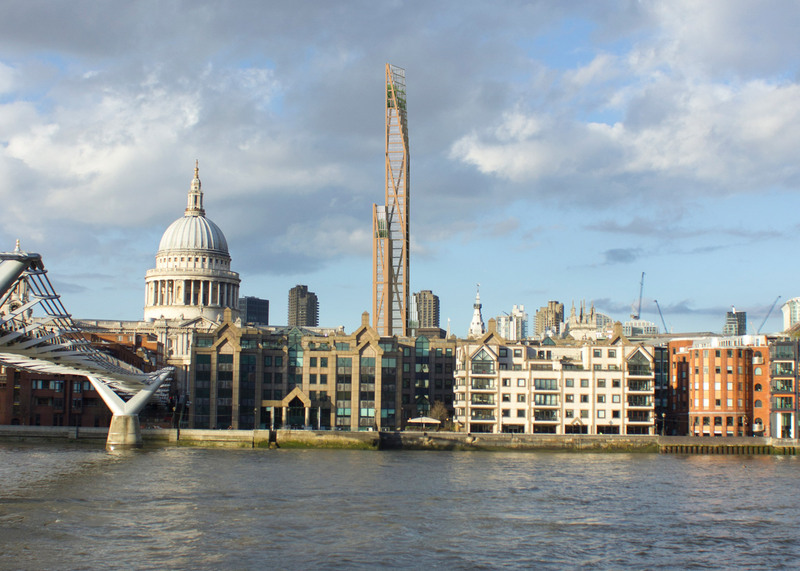 If realised, it could become London's second tallest building, after The Shard, and the tallest wooden structure in the world. Up to 1,000 new homes could be included in the 93,000-square-metre floor plan, which would also include mid-rise terraces. Renderings show a pair of adjoining towers with chamfered corners and visible bracing. Timber is being lauded as a lightweight and sustainable substitute for traditional construction materials, which could also help to speed construction times and reduce carbon emissions. "The use of timber as a structural material in tall buildings is an area of emerging interest for its variety of potential benefits; the most obvious being that it is a renewable resource, unlike prevailing construction methods which use concrete and steel," said a statement from the University of Cambridge. The proposal is designed and engineered to stand, and to meet the fire regulations in place for concrete and steel buildings, but no timber building of this scale has ever been attempted. The world's tallest wooden building to date is a 14-storey apartment block in Bergen, Norway, but several more are in the pipeline. Last month, French architect Jean Paul Viguier revealed his competition-winning proposal for a trio of timber towers in Bordeaux that will rise to 57 metres, and Swedish studio Tham & Videgård Arkitekter has drawn up plans for a row of wooden apartment blocks in Stockholm. While innovation in steel, glass and concrete "revolutionised" building in the 19th and 20th centuries, wood will do the same for the 21st century, said the Oakwood Tower team. "Timber is our only renewable construction material and in its modern engineered form it can work alongside steel and concrete to extend and regenerate our cities," said Simon Smith of Smith and Wallwork. "It is only a matter of time until the first timber skyscraper is built." Renderings show the towers protruding above the concrete blocks of the Barbican housing estate and its arts centre, which was designed in the 1950s by British firm Chamberlin, Powell and Bon, and is one of the best-known examples of Brutalist architecture. "The Barbican was designed in the middle of the last century to bring residential living into the city of London – and it was successful," said Michael Romage, director of Cambridge's Centre for Natural Material Innovation, which brings together architecture, engineering, material and construction researchers. "If London is going to survive it needs to increasingly densify. One way is taller buildings. We believe people have a greater affinity for taller buildings in natural materials rather than steel and concrete towers," he continued. The estate's 17-storey youth hostel was recently converted into high-end apartments by design and architecture studio Conran and Partners. PLP Architecture is behind a series of innovative skyscraper designs including a co-living space in London for shared accommodation provider The Collective, and a supertall tower composed of three rotated, interlocking volumes in China.